It took three days, but I finally visited the real Russia on Saturday morning when I traveled to the Central Air Force Museum in Monino. During the hour-and-a-half commuter train ride, local entrepreneurs walked between train cars, hawking everything from knives to umbrellas. Just take a moment to imagine what would happen if a guy started waving around a knife on a SMART train. Arriving in Monino, I walked a mile among crumbling apartment blocks before reaching one of the largest outdoor aviation museums in the world. I giddily snapped pictures of MiGs, Ilyushins and Tupolevs. It was a blast getting to see all those Cold War–era fighter jets and passenger planes, but by the time I returned to Moscow around 2pm I was hungry and, more importantly, thirsty for beer. Rizhaya Sonya Ginger IPA's label depicts a grinning ginger lass brandishing a Medieval mace wrapped around a bazooka. Like the old warplanes I had seen that morning, it has an industrial vibe, so I had a bottle with lunch. The beer was an acceptable complement to the food, but didn't deliver on the promise of ginger. It was there, but only slightly, as if the brewer had thrown a single hand of ginger into the tank at the last minute. Honestly, the beer would have been better without it. Verdict: Sorry, fellas, but she's not a natural redhead. NOT OVER THE MOON Sibirskaya is a Blue Moon imposter! Do you enjoy the kitsch of a '90s Applebee's, the nostalgia of a '50s diner and the Soviet Union? If so, then Varenichnaya No. 1 is the restaurant for you! The chain appeals to Russian adults who grew up in the late '70s-early '80s and now pine for the era's simple comfort food. 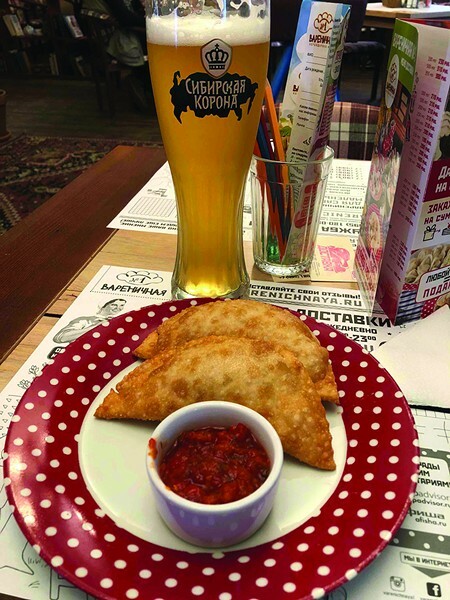 Surrounded by knick-knacks that included an old Soviet radio and television, I ordered a Sibirskaya (Siberian Crown) unfiltered lager and two pastry shells stuffed with minced lamb. Sibirskaya has an interesting American connection. A couple of years ago, some company reps pulled up to actor David Duchovny's house in a dumptruck full of rubles and convinced him to star in a two-minute commercial where he extolled the virtues of being Russian. To its credit, the ad boasts the highest production value of any Russian propaganda film since the end of the Cold War. But like life in the Soviet Union under Brezhnev, the lager is stagnant. The beer's only redeeming quality was that it cut the taste of my meal—the pastry shells exploded with grease the moment I cut into them. Verdict: David, you fool! You sold your soul for some ersatz Blue Moon! The Tretyakov Gallery contains one of the most stunning paintings you'll ever see. Ilya Repin's Ivan the Terrible and His Son Ivan on November 16, 1581 depicts the crazed czar just moments after he struck his heir on the head with a gold scepter. His eyes haunted and devastated, Ivan futilely attempts to stop the flow of blood from his adult son's left temple. Blood stains the ornate carpet beneath the two men. I felt compelled to imbibe an amber ale. Just down the street from the Tretyakov was Miles, a chill cafe that serves beer, burgers and coffee. While sitting on a couch on the upper floor, I sipped a Landau Beerlab Red Whale Amber Ale. The name was a mouthful, and so was the beer. The initial taste was light and fruity, but after swallowing, it left a denser flavor, a pleasant spiciness that lingered on my tongue. It was my first beer in Russia that I savored to the last drop. Verdict: Russia's secret weapon to close the beer gap.